Wargaming Forum and Wargamer Forums > Wargaming News, New Releases and Information > Wargaming News and 40k Rumors > Necromunda Returns! Looks like it's getting a proper ad campaign. Miniatures look fantastic but I will wait for other gangs. Delaque and Enforcers were always my favourite. But I guess all new miniatures will be great. Get ready for a new generation of war in the underhive – Necromunda is coming back. We already knew that the classic game of underhive gang-war was returning later this year, and now, after the Studio Preview at the NOVA Open, we know a lot more. 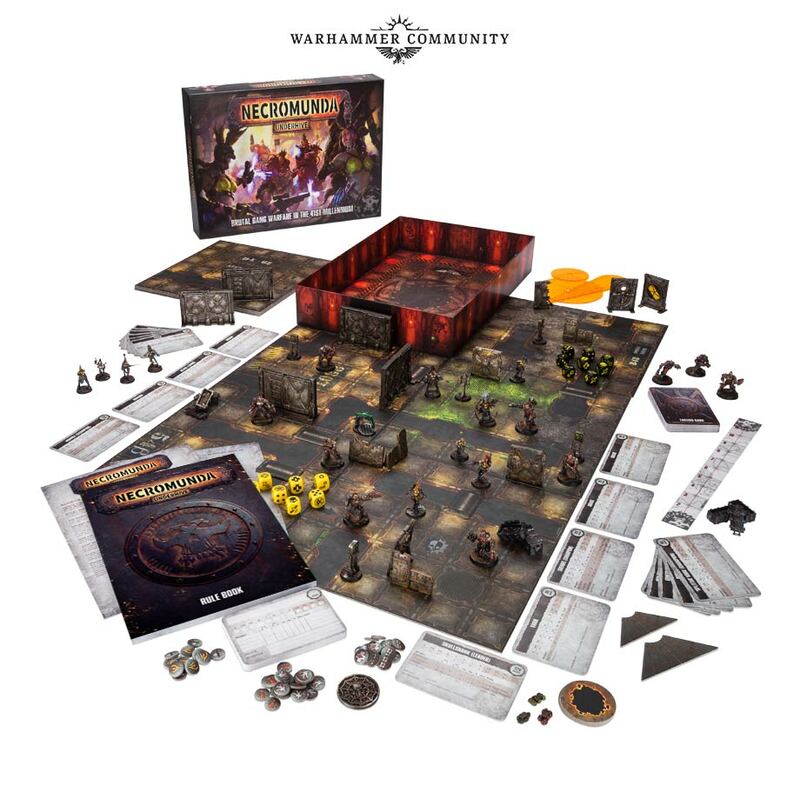 The new core set for this game is absolutely packed with content to get you started: a full board representing the sewers and confines of the underhive, a rulebook, character cards, templates, dice and of course, your gangs. There are two full gangs in the box – one set of nimble warrior-women from House Escher and one set of gene-crafted brutes from House Goliath. Each of these miniatures is detailed, characterful, and true to the classic spirit of Necromunda – hairstyles and all! We’re very pleased to say that both these gangs will be full, multi-part kits, with an enormous level of customisation. One of the best things about Necromunda is building a gang and equipping your gangers with wargear, and each kit is absolutely packed with options. There are weapons for any situation, from classics like the stub gun to more esoteric choices like the repurposed industrial equipment of House Goliath or the chem-weapons of the Eschers. As well as these, you’ll be able to arm your gangers with grenades, gas masks, additional armour and even modular hairstyles. Whichever gang you build, each member will be a character in their own right – perhaps a lumbering Goliath bruiser equipped with a rudimentary stub-cannon, or a fast moving Escher assassin wielding twin duelling laspistols. The set’s gaming tiles and simple bulkhead scenery allow you to play games very quickly and easily, and make the game very portable. As well as the underhive style of play covered by the boxed set, there will also be ways to play Necromunda with the multi-level skirmishes that defined the classic version of the game. These work great on tables using the Sector Mechanicus terrain sets released earlier this year (great news for anyone who built a Shadow War Armageddon board). Both ways to play are tense, tactical games that recreate the no-holds-barred brutality of underhive war – you’re going to have a blast. We’ll be taking a closer look at Necromunda nearer to its release, including what you can expect from the rules, how you’ll be able to build your gang and much more – in the meantime, let us know what you’re most excited about on the Warhammer 40,000 Facebook page. The battle for the underhive starts this November. I'm so excited i think i wee'd a little bit. we’ve had loads of questions from Necromunda fans about when Delaque, Cawdor, Orlock and Van Saar will be joining Goliath and Escher in glorious plastic. 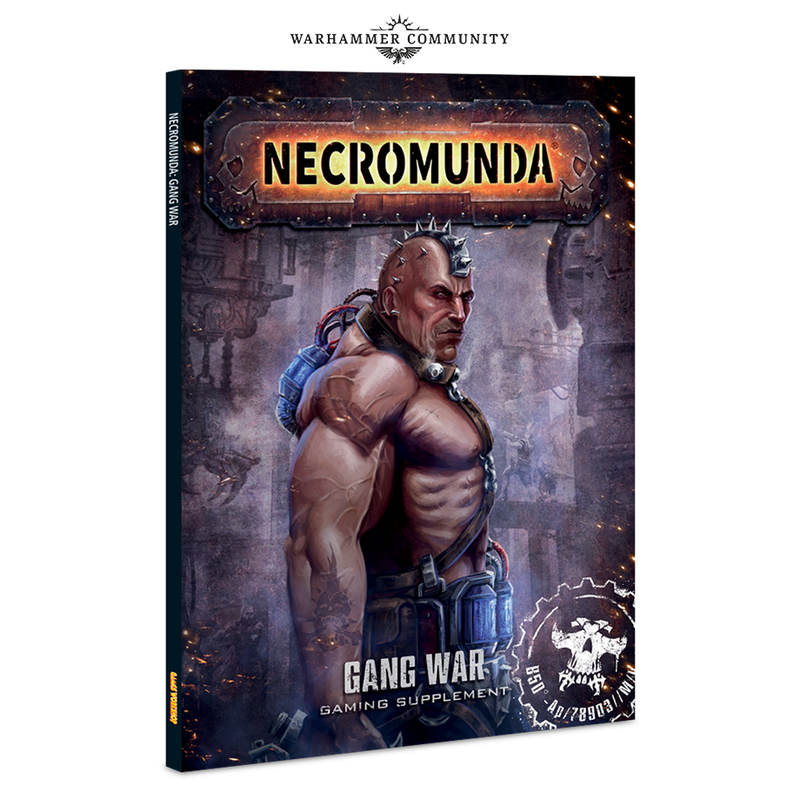 We’re pleased to say that Necromunda: Underhive and Gang War will be but the first of many Necromunda releases. While Goliath and Escher will be available in their own boxes from day one, they’ll be followed by the four other Clan Houses in 2018. If you’re eager to get stuck in straight away, make sure to like the Necromunda Facebook page for the latest news and updates about the game, and be sure to check out the Necromunda website. Necromunda is up for preorder, and some extra stuff is dropping for it already. Nice to see a nod to the old lord. The next generation of Necromunda is less than two weeks away, but it’s only just the beginning. Whether you’re planning on playing with the warrior-women of House Escher or conquering the underhive through the might of House Goliath, thanks to Forge World, you’ll be able to add a bestial bounty hunter to your roster – if you’ve got the credits. Meet Gor Half-Horn. Nobody knows where this mysterious bounty hunter comes from, or quite how a member of one of the most hated subgroups in the Imperium* managed to get a bounty hunting license. Look familiar? That’s because Gor Half-Horn is, in fact, a re-imagining of a classic model from Rogue Trader from the abhuman auxilla – inspect him closely and you’ll even notice the Imperial Aquila on his chest. Wherever he’s from, Gor makes for a valuable asset in your Gang War campaigns. If you’re rich in credits, but your Gangers have an unfortunate habit of dying, or you really, really need a particular rival in the campaign taken out, you can hire Gor for a single game. On the tabletop, he’s a terror, combining mutant strength with a LOT of firepower and a pretty awful temper – whatever you do, if your opponent hires Gor, do NOT let him charge you! Gor Half-Horn’s rules and fighter card are included with the model, as well as rules for adding him to your gang in both one-off and campaign games of Necromunda. This is just the first of what Forge World has planned for the game of gang warfare in the 41st Millennium – like Blood Bowl, there are plenty of awesome models in the pipeline to support the plastic ktis and gangs you’ve already seen. This guy will be available to pre-order on Friday, meaning if you get yours, he should show up around the same time as the rest of your Necromunda orders. More hive scum minis. These look fantastic.